In a surprising and touching turnout, tens of thousands of people around the world turned on their ham (or amateur) radios to participate in several “NASA on the Air” events held over the past year. “This was a beautiful thing,” said Kevin Zari, head of the amateur radio club at NASA’s Kennedy Space Center. Zari especially loved the event photos tweeted by people from different countries. The NASA on the Air event wrapped up with three special opportunities for people to use their radios to download images from the International Space Station. This was done in coordination with Amateur Radio on the International Space Station (ARISS), an international consortium of amateur radio organizations and space agencies. 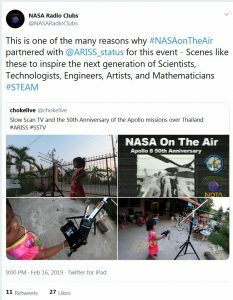 ARISS encourages young people to explore science, technology, engineering and math through the use of ham radios, and their program works to connect students worldwide with astronauts onboard the space station. For the final three events, cosmonauts on the station transmitted several NASA on the Air images from space. Participants could compete to collect images and upload them to a website for credit. Over 34,600 uploads were received from 18,619 participants. The reaction to NASA on the Air was so positive, NASA Radio Clubs plans to activate NASA on the Air for special anniversaries in 2019 and beyond (e.g. 50th Anniversary of Apollo 11). Follow @NASARadioClubs on Twitter or join the NASA on the Air (NOTA) group on Facebook for notifications of future activities.